Here at Rose Property Services we recruit and train all of our team members internally so that they achieve the high standards and the friendly customer orientated services upheld by our company. We are proud to say that over time this has proved invaluable and enables us to deliver service efficiently and positively ensuring your expectations are met fully. 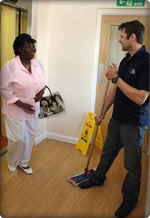 Our uniformed mobile teams currently deliver cleaning and gardening services to over 300 commercial and residential properties in and around London. Alongside this, we also provide window cleaning to blocks of flats and offices, making this specific service available for both residential and commercial areas. To ensure the work on site is being delivered to an excellent standard, we have several supervisors who are continually out and about inspecting the progress of our teams work. We deem this to be a unique and incredibly beneficial aspect of our services as small items that might otherwise be missed can be quickly identified and taken care of. Our reputation has been upheld over the years by word of mouth recommendations. We consider this to be the very best form of compliment and if you, as a future client, would like a reference or to find out more about the high standards we uphold from existing clients please do not hesitate to ask.